There is a screen capture of dialog box of ctg book. You will notice the column Fact for "The Factor"
1) Can anyone explain what the color codes, and those asterisks in yellow, green, red please? 2) And why a move that has "Fact" a negative number red has a larger percentage and a greater Probability than a positive green move "Fact" ? Moves: (Tree icon) Sometimes a move will appear in grey, which means that it was never played, but leads to a position that results from some other line. N: (N) The header displays the total number of games which led to the current board position. The N column displays the number of games in which each move was executed. %: Percentage score achieved by the move, always from the point of view of the colour to play. If the number of games is low, the percentage is given in grey because it does not have great statistical significance. Av: Elo average of the players of the move. If only a small percentage of the players had a rating, then the number is given in grey. Perf: Elo performance of the move. This is the rating a player would have achieved in a fictitious tournament, playing the move in all his games. Fact: The factor or "weights" allocated to each move control the probability with which it will choose the move in a game. The value can range between –125 to +125.The values are initially set to zero, but may change when the program actually plays games in the individual variations. You could say that the program is learning from experience. The weights can be manually modified by right-clicking a move and selecting “Change weight”. To reset all weights click Edit – Openings book – Reset weights. After that, the program will use only the purely statistical information to select its moves. Prob and [%]: The first value is the purely statistical probability of the move,based on the number of times it was played and the results achieved in the games that went into the book. This is the probability of the move being played by the program as long as the weights have not been changed – either manually or by automatic learning. 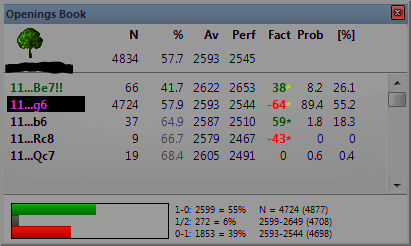 The value on the right [%] is the practical probability of the program playing the move. This is a product of the statistical evaluation and the weights. If you change the latter you can see how the [%] value (but not the “Prob”) changes. In Book options you can determine how much the weights influence the probability of play. Black - program will play the move based purely on statistical performance in tournaments ie. if the statistical performance is good it will be selected. Green - program will play the move regardless of the statistical performance. But I wanted to understand how to interpret colours (green red yellow) of the column Fact? Namely: Is the color on the view side of the White or the one whose turn it is to play? What is the right move there? The value in the fact column is the weighting allocated to that move and sets how likely it is that the engine will choose that move.The value can range between –125 to +125 with -125 being least likely to be chosen and +125 most likely to be chosen. Any negative (-) value will set the colour of the weighting in the fact column to red, and any positive value will set the the colour of the weighting in the fact column to green (not to be confused with the main red/green colouring in the "move" column which is different - that sets whethr the move will be played at all or not). a) Manually - by right-clicking a move and selecting “Change weight”. You can then input any value from -125 to +125. b) Automatically - by book learning. As long as you have the book learning options switched on in the book options (F4 then use the sliders) then after each game played using the book, the result will cause the weightings to change. If white wins a game, then the white moves played in the opening book line for that game get an increased weighting (eg. from 30 to 50). If white loses a game then the moves played in the opening book line get a decreased weighting (eg. from 50 to 30). The same thing happens for the black moves with wins and losses.. The asterisk in the fact column shows what happened during the last game played in terms of whether that move wwas part of a line that won or lost. So green asterisk means win, red asterisk means loss and yellow asterisk means draw. If you change the weighting manually as in (a) above then there is no asterisk and no change to existing asterisk. The asterisk only changes to reflect the last game actually played. Whats is for you the best move for the black side according to the learning values ? According to the learning values in the fact column then for the games played using this book in this position the best move would be 11...b6 because it has won more often than the other moves in this same position (it has the highest green weighting). But be careful - that just means according to the results achieved by the engine playing with this book. The book author may have reason to think that 11...Be7 is stronger as he has marked it as a green main move (tournament move) and given it double exlamation mark whcih means "brilliant move". There is a balance between relying on book learning to change the weightings automatically, versus manually hand tuning the book to force it to play certain moves. The risk with relying solely on book learning is that the weightings of the opening moves will be automatically changed purely according to the result of the game - this does not necessarily mean the win or loss was due to opening line being better or worse. The game may have been won beacause your computer is more powerful, or because the engine played a better end game and won - but the weighting of the opening line moves will still be increased making it more likely to be selected next time in the same position. This is why may book makers prefer to tune the book manually rather than rely on book learning ie. in any given position with the book open run the engine on infinite analysis to a dertian depthe (the longer the better) then whatever it recommends as the best move, you manually tune the book to play that move by colouring it and/or changing the weighting by hand. you spoke in powerful machine. How much influence on a PC game?? is basically the engine and book?? or is the machine who's to win?? sorry to interference in the matter. Thank you for answering my questions. I think I'll trust the learning values ​​and mark green for generating some games. @Paulo s r Lemes wrote: you spoke in powerful machine. How much influence on a PC game?? is basically the engine and book?? or is the machine who's to win?? sorry to interference in the matter. But in small Time control (3-mins) the machine takes over a good book.